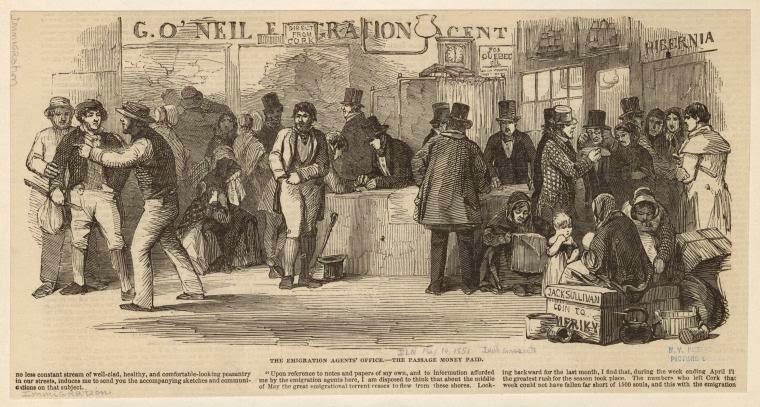 This picture captures the most rudimentary but fundamental act during emigration: paying the emigration agent. The various signs in the picture advertize: "G. O'Neil E[mig]ration [Ag]ent", "Direct from Cork", "For Quebec", and "Hibernia." In the right foreground, a woman sits on a box that says: Jack Sullivan Goin to Ameriky [sic]. In the background, there seems to be a woman and child in distress, possibly due to they or a loved one leaving Ireland. The second and third paragraph make reference to a particularly busy time of year when many people left Cork: "Upon reference to notes and papers of my own, and to information afforded me by the emigration agents here, I am disposed to think that about the middle of May the great emigrational torrent ceases to flow from these shores. Looking backward for the last month, I find that, during the week ending April 11 the greatest rush for the season took place. The numbers who left Cork that week could not have fallen far short of 1500 souls…" The date May 10, 1851 has also been written on the picture. Next Tuesday (24th) I will be giving a talk in Basking Ridge, New Jersey. The title is Finding Your Irish Townland of Origin: Research in the U.S. and Ireland. Full details are at the end of this post. Basking Ridge is only about 30 miles west of Manhattan so hopefully the venue will be reachable for as many people as possible. I'm looking forward to the talk and would like to thank the Bernards Township Library Family History Interest Group and Morris Area Genealogy Society for inviting me. Hopefully, I can help some people find their townland of origin. The millions of Irish who came to the United States in the 19th century did not make it easy for their descendants to find where they came from in Ireland. Finding their townland of origin is the ultimate aim of anyone with Irish ancestry. If you have already combed through the census, searched vital records, written away for Church records, and scrutinized the city directories, only to find "from Ireland", then this talk is for you. Firstly, the focus is on Irish genealogical research in America. Relevant strategies for breaking through brick walls will be discussed in detail. This will be coupled with records and sources where you can find the Irish place of origin. Then the focus switches to Ireland, with a explanation of the main genealogy record sets: civil registration, parish registers, tax records, censuses, and criminal/legal records. This important focus on the past will be coupled with current developments in Irish genealogy, in the shape of the best books, blogs, and websites. Tuesday, 24 June: Finding Your Irish Townland of Origin: Research in the U.S. and Ireland. Hosted by Bernards Township Library Family History Interest Group and Morris Area Genealogy Society. Venue: Bernards Township Library, 32 South Maple Ave., Basking Ridge, New Jersey, USA. 6:30pm - 8:45pm. Free, no booking required. Email RLufkin@bernards.org for more information. The Centre for the Study of Historic Irish Houses and Estates at the National University of Ireland, Maynooth is currently carrying out research on the topic of Famine-era assisted emigration from Strokestown, Roscommon to Canada. The focus of this research are the tenants of the Strokestown Park estate who were sent from Ireland in 1847. In May of that year, 1,490 tenants left Liverpool for Quebec in British North America (Canada). They traveled on four ships: the Virginius, Naomi, John Munn, and the Erin’s Queen. Unfortunately, before 1865 there are few passenger lists for immigrants coming to Canada. However, sources such as the Filby's phenomenal Passenger and Immigrant List Index (available on Ancestry.com) can help to fill the void. Library and Archives Canada also has a useful webpage about immigration before 1865. Have you been able to trace your ancestors back to a May 1847 arrival in Quebec on one of those ships? If so, your next trip could be to county Roscommon. To learn more about this assisted emigration, you can consult a news article from early May on the Journal.ie website. Parts of Montana, particularly Butte, have long had large concentration of residents with Irish ancestry. In an effort to try and preserve their stories, traditions, and folk memories, the Irish Studies department at the University of Montana has carried out an oral history project since 2009. The Gathering: Collecting Oral Histories of the Irish in Montana is an online archive of interviews carried out with Irish-Americans who live in the state. As of June 2014, there are over one hundred interviews in the collection. Whilst the topics discussed with the contributors are wide-ranging, many talk about their recent and deeper family ancestry, including their knowledge of immigrant ancestors. You can select and listen to all interviews by clicking here. The Diocese of Wilmington was established in 1868 and today covers the state of Delaware and nine Maryland counties on the Delmarva Peninsula. 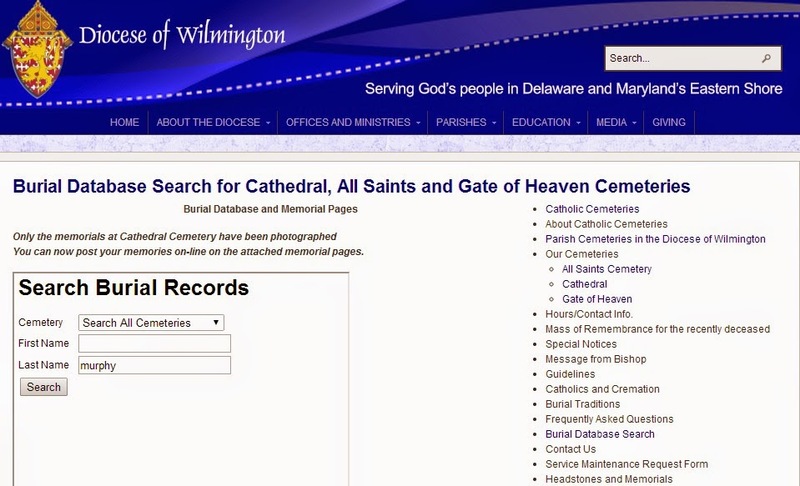 The three largest cemeteries in the diocese are Cathedral cemetery (Wilmington, DE, opened 1876), All Saints (Wilmington, DE, opened 1958), and Gate of Heaven (Dagsboro, DE, opened 2002). A searchable database is available on the diocesan website for these three cemeteries. Details in the database include name, date of death, and plot location. Existing headstone/grave markers in Cathedral cemetery have been photographed and are also available to view. The diocesan website also lists location and contact information for 18 current and 4 closed parish cemeteries. Search the database by clicking here. These numbers are based on an analysis of naturalization records for the city, of which many give an Irish place of origin. More broadly, fully 53% of Irish people who naturalized in Providence between 1840 and 1860 were from Ulster counties - Tyrone, Monaghan, Antrim, Cavan, Fermanagh, Donegal, Down, Derry/Londonderry, and Armagh (listed in order of percentage of overall total). 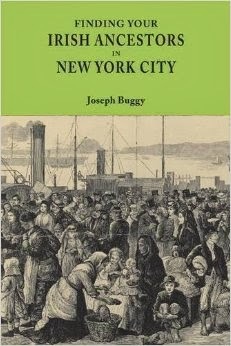 An analysis such as this is an outstanding example of how local history knowledge in Ireland can be combined with a study of particular record sets in the U.S., to create clear evidence of migration from one part of Ireland to one city in America. This is the journal of the Clogher Historical Society. Their research focuses on the diocese of Clogher, which consists of Monaghan, much of Fermanagh, and parts of Tyrone and Donegal. McCarron, Edward T. Altered States: Tyrone Migration to Providence, Rhode Island During the Nineteenth Century. Clogher Record. Vol. 16. No. 1. 1997. pp. 145-161.